** Keith Olbermann tonight displayed a graphic showing Rep. Giffords as one of Sarah Palin’s targets. ** Paul Krugman blamed conservatives and Republicans. ** Arizona State Senator Linda Lopez blamed tea party patriots. 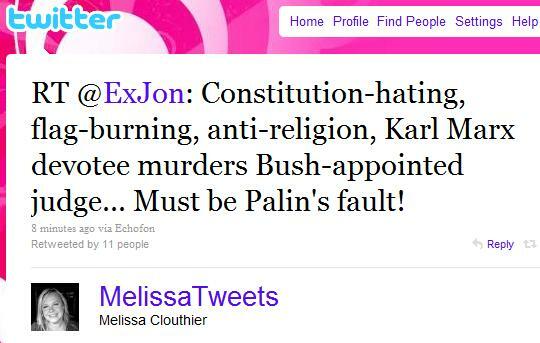 ** Leading leftist blogs Daily Kos (Markos Moulitsas) and Crooks and Liars blamed Sarah Palin. ** Pima County AZ Sheriff Clarence Dupnik blamed the “prejudice and vitriol” in Arizona for the shooting today. ** Jane Fonda blamed Sarah Palin. These people just can’t help it.